This is the week in which I have to take a sketchbook filled with notes, ideas, and sketches and turn it into a cohesive plan--yikes! My main goal for the first day is to form a friendly, productive group. There will also be some norming involved as kids test our group. I want to keep a fast pace with lots of different kinds of activities throughout the day. Over the course of these activities discussions of rules and expectations will naturally arise. Students won't have to sit down and listen to a long lecture on rules--instead, they'll be actively involved in creating our group expectations for the entire day. Here is my tentative schedule for the first day. What do you think? You'll notice that the day is chunked into blocks. This is because there are always unexpected things that happen on the first day, and thinking in terms of shorter time blocks makes it easier to be flexible. Also, if an activity flops (and they sometimes do!) I can move on and tweak my other times from there. What does your first day schedule look like? If you want to purchase UV beads for your students, check out this link to Educational Innovations. They also have a blog post describing how the beads work. One bag of 250 beads is plenty to provide beads for a class. TpT Sale: I was on vacation for the first one, but I have a sale set up for the bonus sale on August 22! You can check out my store here. Right now Pinterest is filled with pictures of gorgeous classroom libraries and book spaces. As I was sitting up my classroom this year, I corrected a small mistake that I made last year. Instead of keeping all my books together, I split up my library! Why a decentralized library? It's easy--more kids can browse at once. My fiction books are displayed at the front of the room, using the book baskets that I made last year. But I moved the nonfiction books and my graphic novel collection to the back, closer to my science and math areas. I decided to make this change in response to my reluctant readers from last year. Many of them would not bring books to class each day, and as a result I would have 6-8 kids browsing for books at the same time. In close quarters, this led to lots of non-book related chatting! I've had decentralized libraries before, and I've always liked how these lead to smaller groups for browsing, better book talk, and a smoother classroom experience. If your classroom lends itself to this arrangement, give it a try! I have 3,000 followers over on TeachersPayTeachers! To celebrate, I've posted a brand new freebie for the start of the school year. 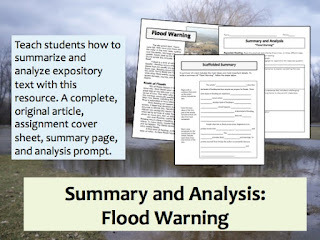 This resource is created as a start of year summarizing and analysis activity. First, students complete repeated readings of an original text; then, they work through a scaffolded summary and a textual analysis. To create this activity, I started with the question, "What would I like to have to teach?" Then I created it! I'm especially pleased with the scaffolded summary--I think this will really help start of year learners to understand how to summarize complex text.